The ham radio dipole is called a half-wave antenna because its length corresponds to an electrical half wave at the frequency for which it is intended. The classic dipole is also called a balanced antenna because it is "fed" at its exact center. 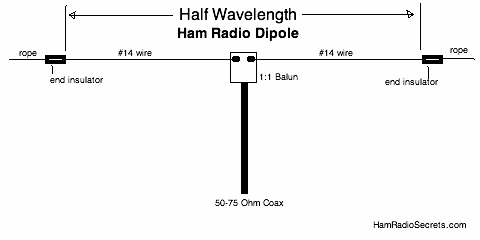 The half-wave ham radio dipole is also the most common antenna used by amateur radio operators throughout the world. Why Is The Dipole So Popular? Because it is an inexpensive, yet effective, antenna, especially if you build it yourself using wire, insulators and rope that you already have in your (or a friend's) "junk box" of spare parts! Here is a simplified illustration of the classic dipole antenna. The characteristic impedance of a half wave dipole is around 73 ohms. However, if the horizontal dipole is between 0.1 and 0.2 wavelength above ground, its impedance will be somewhat lower and closer to 50 ohms ... the characteristic impedance of commonly used coaxial transmission line such as RG-8, RG-8X and RG-58. As a bonus, the impedance will remain low at odd harmonic multiples of the basic frequency! Yes, you can operate a 40 meter (7 MHz) dipole on 15 meters (21 MHz) too. A two-for-one antenna! The antenna (the radiating and receiving portion). The transmission line (carrying the RF energy between the antenna and the transceiver). The impedance matching unit between the transmission line and the transceiver. The length of wire given by the formula is cut in half to make both sides of the dipole. the proximity of metal structures and other objects. Cut your dipole wire some 2-3% longer than the length given by the formula. Make a note of the length obtained in step 1. Raise the dipole to its operating height. Measure the SWR at several frequencies within the intended frequency band. (Use only a few watts and pick a quiet time on the band to make your tests). Note the frequency (F_min) at which minimum SWR is obtained. Multiply (F_min) by the antenna length recorded in step 2. Divide the result of the above multiplication by the desired frequency of operation, to obtain the final length. Trim both ends of the dipole down to the final length obtained in step 7. 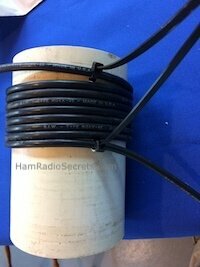 You can feed your dipole with coax, as already mentioned above. However, coaxial cable is unbalanced! When feeding a balanced load, such as a dipole, with an unbalanced transmission line, the antenna will induce RF currents on the outer shield of the coax. 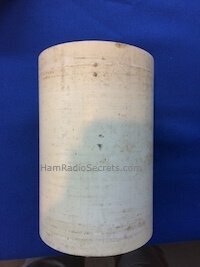 These unwanted RF currents spell nothing but trouble, not the least of which are RFI (radio frequency interference) and stray RF in the shack to play havoc with your computer or other delicate electronic devices! 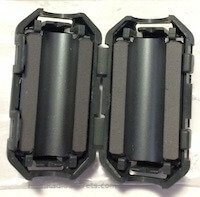 Fortunately, you can prevent these unwanted RF currents from traveling back on the outer shield of your coaxial transmission line ... with a RF choke. 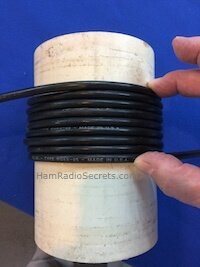 To make a choke balun, all you need to do is wind a portion of the coaxial transmission line to form a coil. A choke balun made of coax is most effective when a single layer is close-wound on a form, such as 4in. plastic drain pipe or 6in. "schedule 40" PVC pipe. The prototype uses a short length of 4 in. diameter PVC pipe (4 3/16 outside diameter). One turn of RG8X will be 14 inches long on the PVC form. Therefore 8 turns will require 9.3333 feet of coax. In other words, the RF choke will take up around 9.5 feet of the RG8X coaxial transmission line feeding your ham radio dipole. Plan that extra length into your overall coaxial line between your antenna and your transmitter or antenna tuner. Ideally, the coaxial line should *not* be cut to allow the RF choke to be inserted in the coaxial run. Otherwise, if you cut your transmission line to insert the RF choke, you will need two weatherproofed junction boxes, each with a SO-239. The RF choke will also have to be fitted with a PL-259 at each end. The connections will have to be carefully weatherproofed with Coax-Seal (TM). To illustrate, here is how I built an eight-turn RF choke for use on 20 meters. The tube does not have to be as long as in the photo. It's a prototype. 1. First, 8 turns of RG8X will become a 2 3/8 in. wide coil on the 4 in. PVC tube that I use as a form. 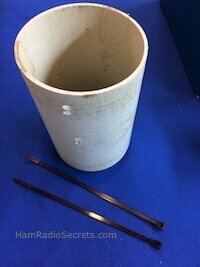 Therefore, for the final version, a three-inch-long PVC tube would be more than long enough to hold the coax coil. 2. You will need to drill holes for the Tiewraps(tm) which will hold the coax coil in place on the tube: mark the position of the holes at each end of the coil. 3. Tie down one end of the coax coil. Then wind the coax on the form. 4. Tie down the other end of the eight-turn coil with a Tiewrap(tm). The table below lists values for each HF amateur band. Form size and number of turns are optimized for each band. 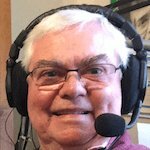 I recommend one choke near your ham radio dipole antenna feed point, and another one about a quarter wavelength down the line, before the coax enters your radio shack. If you intend to use your dipole on its odd harmonics (more than one band) then use the following table to construct your RF chokes. Take your ham radio dipole down at least once a year (twice or more if you have had severe weather) to check for damage (frayed ropes, damaged coaxial shield or connection, etc). Many kinds of wire, insulators and rope can be pressed into service for a temporary installation. But for a permanent and safe all-weather installation, here is what I recommend. I use either #14 stranded (7x22) hard-drawn copper wire, for spans less than 45 meters (150 ft.) between stable supports. 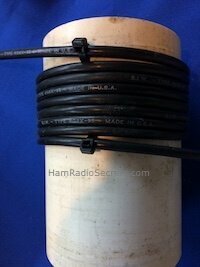 or the very strong VariFlexTM #13, 19 strand, copper-clad steel wire when the antenna needs to be strung between trees. 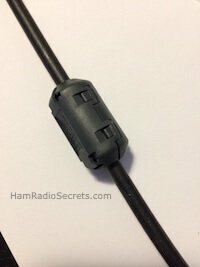 You can use a ceramic "dogbone" as center insulator, but you will have to wrap your coax around it, tie it securely, then split the center conductor and braid to connect to each side of your ham radio dipole ... and seal to prevent water from seeping in the coax! Not exactly the best. I prefer using a center insulator with a SO-239 ... much easier to seal. Of course, you could use a 1:1 balun at the dipole feed point. It will serve as center insulator and coax connector. The balun will improve the radiation pattern somewhat ... if your dipole is at least 1/4 wavelength above ground. Finally, I use #5 Delta CIN ceramic end insulators for their resistance and long leakage path. I have had a dipole strung between two large trees for years with (3/16") Mil Spec Dacron® rope. It is still up there! This rope is very strong and abrasion resistant.